IPython 0.11 is a major overhaul of IPython, two years in the making. Most of the code base has been rewritten or at least reorganized, breaking backward compatibility with several APIs in previous versions. It is the first major release in two years, and probably the most significant change to IPython since its inception. We plan to have a relatively quick succession of releases, as people discover new bugs and regressions. Once we iron out any significant bugs in this process and settle down the new APIs, this series will become IPython 1.0. We encourage feedback now on the core APIs, which we hope to maintain stable during the 1.0 series. Since the internal APIs have changed so much, projects using IPython as a library (as opposed to end-users of the application) are the most likely to encounter regressions or changes that break their existing use patterns. We will make every effort to provide updated versions of the APIs to facilitate the transition, and we encourage you to contact us on the development mailing list with questions and feedback. Chris Fonnesbeck recently wrote an excellent post that highlights some of our major new features, with examples and screenshots. We encourage you to read it as it provides an illustrated, high-level overview complementing the detailed feature breakdown in this document. Standalone Qt console: a new rich console has been added to IPython, started with ipython qtconsole . In this application we have tried to retain the feel of a terminal for fast and efficient workflows, while adding many features that a line-oriented terminal simply can not support, such as inline figures, full multiline editing with syntax highlighting, graphical tooltips for function calls and much more. This development was sponsored by Enthought Inc.. See below for details. High-level parallel computing with ZeroMQ. Using the same architecture that our Qt console is based on, we have completely rewritten our high-level parallel computing machinery that in prior versions used the Twisted networking framework. While this change will require users to update their codes, the improvements in performance, memory control and internal consistency across our codebase convinced us it was a price worth paying. We have tried to explain how to best proceed with this update, and will be happy to answer questions that may arise. 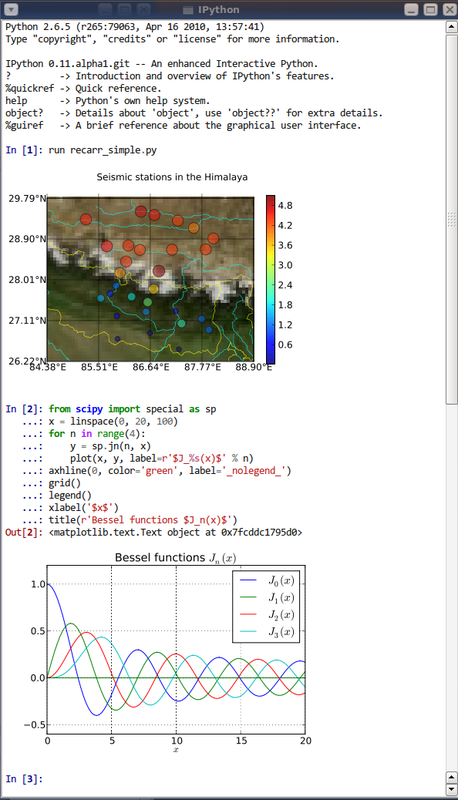 A full tutorial describing these features was presented at SciPy‘11, more details below. New model for GUI/plotting support in the terminal. Now instead of the various -Xthread flags we had before, GUI support is provided without the use of any threads, by directly integrating GUI event loops with Python’s PyOS_InputHook API. A new command-line flag –gui controls GUI support, and it can also be enabled after IPython startup via the new %gui magic. This requires some changes if you want to execute GUI-using scripts inside IPython, see the GUI support section for more details. A two-process architecture. The Qt console is the first use of a new model that splits IPython between a kernel process where code is executed and a client that handles user interaction. We plan on also providing terminal and web-browser based clients using this infrastructure in future releases. This model allows multiple clients to interact with an IPython process through a well-documented messaging protocol using the ZeroMQ networking library. Refactoring. the entire codebase has been refactored, in order to make it more modular and easier to contribute to. IPython has traditionally been a hard project to participate because the old codebase was very monolithic. We hope this (ongoing) restructuring will make it easier for new developers to join us. Vim integration. Vim can be configured to seamlessly control an IPython kernel, see the files in docs/examples/vim for the full details. This work was done by Paul Ivanov, who prepared a nice video demonstration of the features it provides. Improved unicode support. We closed many bugs related to unicode input. Python 3. IPython now runs on Python 3.x. See Python 3 support for details. New profile model. Profiles are now directories that contain all relevant infromation for that session, and thus better isolate IPython use-cases. SQLite storage for history. All history is now stored in a SQLite database, providing support for multiple simultaneous sessions that won’t clobber each other as well as the ability to perform queries on all stored data. New configuration system. All parts of IPython are now configured via a mechanism inspired by the Enthought Traits library. Any configurable element can have its attributes set either via files that now use real Python syntax or from the command-line. Pasting of code with prompts. IPython now intelligently strips out input prompts , be they plain Python ones (>>> and ...) or IPython ones (In [N]: and `` ...:``). More details here. Over 60 separate authors have contributed to this release, see below for a full list. In particular, we want to highlight the extremely active participation of two new core team members: Evan Patterson implemented the Qt console, and Thomas Kluyver started with our Python 3 port and by now has made major contributions to just about every area of IPython. Enthought Inc funded the development of our new Qt console, an effort that required developing major pieces of underlying infrastructure, which now power not only the Qt console but also our new parallel machinery. We’d like to thank Eric Jones and Travis Oliphant for their support, as well as Ilan Schnell for his tireless work integrating and testing IPython in the Enthought Python Distribution. Nipy/NIH: funding via the NiPy project (NIH grant 5R01MH081909-02) helped us jumpstart the development of this series by restructuring the entire codebase two years ago in a way that would make modular development and testing more approachable. Without this initial groundwork, all the new features we have added would have been impossible to develop. Sage/NSF: funding via the grant Sage: Unifying Mathematical Software for Scientists, Engineers, and Mathematicians (NSF grant DMS-1015114) supported a meeting in spring 2011 of several of the core IPython developers where major progress was made integrating the last key pieces leading to this release. Microsoft’s team working on Python Tools for Visual Studio developed the integraton of IPython into the Python plugin for Visual Studio 2010. Google Summer of Code: in 2010, we had two students developing prototypes of the new machinery that is now maturing in this release: Omar Zapata and Gerardo Gutiérrez. In April 2010, after one breakage too many with bzr, we decided to move our entire development process to Git and Github.com. This has proven to be one of the best decisions in the project’s history, as the combination of git and github have made us far, far more productive than we could be with our previous tools. We first converted our bzr repo to a git one without losing history, and a few weeks later ported all open Launchpad bugs to github issues with their comments mostly intact (modulo some formatting changes). This ensured a smooth transition where no development history or submitted bugs were lost. Feel free to use our little Launchpad to Github issues porting script if you need to make a similar transition. Since our move to github, 511 issues were closed, 226 of which were pull requests and 285 regular issues (a full list with links is available for those interested in the details). Github’s pull requests are a fantastic mechanism for reviewing code and building a shared ownership of the project, and we are making enthusiastic use of it. This undercounts the number of issues closed in this development cycle, since we only moved to github for issue tracking in May 2010, but we have no way of collecting statistics on the number of issues closed in the old Launchpad bug tracker prior to that. We hope that many projects will embed this widget, which we’ve kept deliberately very lightweight, into their own environments. In the future we may also offer a slightly more featureful application (with menus and other GUI elements), but we remain committed to always shipping this easy to embed widget. See the Qt console section of the docs for a detailed description of the console’s features and use. We have completely rewritten the Twisted-based code for high-level parallel computing to work atop our new ZeroMQ architecture. While we realize this will break compatibility for a number of users, we hope to make the transition as easy as possible with our docs, and we are convinced the change is worth it. ZeroMQ provides us with much tighter control over memory, higher performance, and its communications are impervious to the Python Global Interpreter Lock because they take place in a system-level C++ thread. The impact of the GIL in our previous code was something we could simply not work around, given that Twisted is itself a Python library. So while Twisted is a very capable framework, we think ZeroMQ fits our needs much better and we hope you will find the change to be a significant improvement in the long run. Our manual contains a full description of how to use IPython for parallel computing, and the tutorial presented by Min Ragan-Kelley at the SciPy 2011 conference provides a hands-on complement to the reference docs. We are still in the process of writing developer focused documentation about these classes, but for now our configuration documentation contains a high level overview of the concepts that these classes express. The biggest user-visible change is likely the move to using the config system to determine the command-line arguments for IPython applications. The benefit of this is that all configurable values in IPython are exposed on the command-line, but the syntax for specifying values has changed. The gist is that assigning values is pure Python assignment. Simple flags exist for commonly used options, these are always prefixed with ‘–’. The long-form options can be listed via ipython --help-all. There is a new GUI framework for IPython, based on a client-server model in which multiple clients can communicate with one IPython kernel, using the ZeroMQ messaging framework. There is already a Qt console client, which can be started by calling ipython qtconsole. The protocol is documented. The parallel computing framework has also been rewritten using ZMQ. The protocol is described here, and the code is in the new IPython.parallel module. A Python 3 version of IPython has been prepared. For the time being, this is maintained separately and updated from the main codebase. Its code can be found here. The parallel computing components are not perfect on Python3, but most functionality appears to be working. As this work is evolving quickly, the best place to find updated information about it is our Python 3 wiki page. Entering non-ascii characters in unicode literals (u"€ø") now works properly on all platforms. However, entering these in byte/string literals ("€ø") will not work as expected on Windows (or any platform where the terminal encoding is not UTF-8, as it typically is for Linux & Mac OS X). You can use escape sequences ("\xe9\x82") to get bytes above 128, or use unicode literals and encode them. This is a limitation of Python 2 which we cannot easily work around. 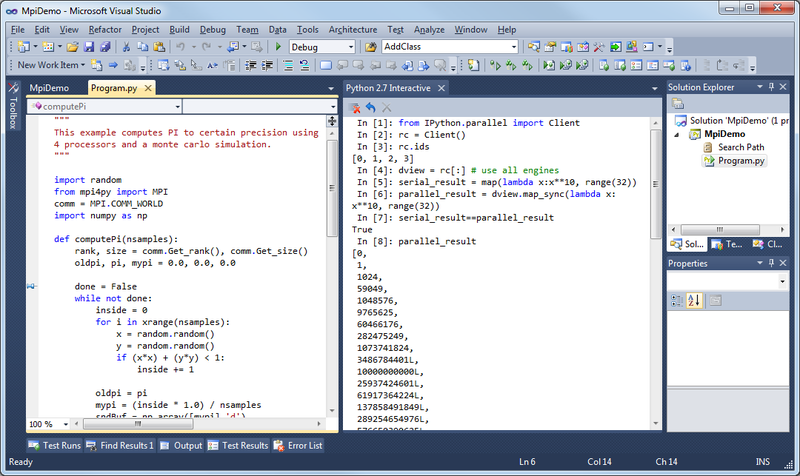 IPython console embedded in Microsoft Visual Studio. The Microsoft team developing this currently has a release candidate out using IPython 0.11. We will continue to collaborate with them to ensure that as they approach their final release date, the integration with IPython remains smooth. We’d like to thank Dino Viehland and Shahrokh Mortazavi for the work they have done towards this feature, as well as Wenming Ye for his support of our WinHPC capabilities. Added Bytes traitlet, removing Str. All ‘string’ traitlets should either be Unicode if a real string, or Bytes if a C-string. This removes ambiguity and helps the Python 3 transition. New magic %loadpy loads a python file from disk or web URL into the current input buffer. New magic %pastebin for sharing code via the ‘Lodge it’ pastebin. New magic %precision for controlling float and numpy pretty printing. You can now get help on an object halfway through typing a command. For instance, typing a = zip? shows the details of zip(). It also leaves the command at the next prompt so you can carry on with it. The input history is now written to an SQLite database. The API for retrieving items from the history has also been redesigned. The IPython.extensions.pretty extension has been moved out of quarantine and fully updated to the new extension API. New magics for loading/unloading/reloading extensions have been added: %load_ext, %unload_ext and %reload_ext. The configuration system and configuration files are brand new. See the configuration system documentation for more details. The InteractiveShell class is now a Configurable subclass and has traitlets that determine the defaults and runtime environment. The __init__ method has also been refactored so this class can be instantiated and run without the old ipmaker module. The methods of InteractiveShell have been organized into sections to make it easier to turn more sections of functionality into components. The embedded shell has been refactored into a truly standalone subclass of InteractiveShell called InteractiveShellEmbed. All embedding logic has been taken out of the base class and put into the embedded subclass. Added methods of InteractiveShell to help it cleanup after itself. The cleanup() method controls this. We couldn’t do this in __del__() because we have cycles in our object graph that prevent it from being called. Created a new module IPython.utils.importstring for resolving strings like foo.bar.Bar to the actual class. Completely refactored the IPython.core.prefilter module into Configurable subclasses. Added a new layer into the prefilter system, called “transformations” that all new prefilter logic should use (rather than the older “checker/handler” approach). Aliases are now components (IPython.core.alias). New top level embed() function that can be called to embed IPython at any place in user’s code. On the first call it will create an InteractiveShellEmbed instance and call it. In later calls, it just calls the previously created InteractiveShellEmbed. Created a configuration system (IPython.config.configurable) that is based on IPython.utils.traitlets. Configurables are arranged into a runtime containment tree (not inheritance) that i) automatically propagates configuration information and ii) allows singletons to discover each other in a loosely coupled manner. In the future all parts of IPython will be subclasses of Configurable. All IPython developers should become familiar with the config system. Created a new Config for holding configuration information. This is a dict like class with a few extras: i) it supports attribute style access, ii) it has a merge function that merges two Config instances recursively and iii) it will automatically create sub-Config instances for attributes that start with an uppercase character. Created new configuration loaders in IPython.config.loader. These loaders provide a unified loading interface for all configuration information including command line arguments and configuration files. We have two default implementations based on argparse and plain python files. These are used to implement the new configuration system. Created a top-level Application class in IPython.core.application that is designed to encapsulate the starting of any basic Python program. An application loads and merges all the configuration objects, constructs the main application, configures and initiates logging, and creates and configures any Configurable instances and then starts the application running. An extended BaseIPythonApplication class adds logic for handling the IPython directory as well as profiles, and all IPython entry points extend it. The Type and Instance traitlets now handle classes given as strings, like foo.bar.Bar. This is needed for forward declarations. But, this was implemented in a careful way so that string to class resolution is done at a single point, when the parent HasTraitlets is instantiated. IPython.utils.ipstruct has been refactored to be a subclass of dict. It also now has full docstrings and doctests. Created a Traits like implementation in IPython.utils.traitlets. This is a pure Python, lightweight version of a library that is similar to Enthought’s Traits project, but has no dependencies on Enthought’s code. We are using this for validation, defaults and notification in our new component system. Although it is not 100% API compatible with Enthought’s Traits, we plan on moving in this direction so that eventually our implementation could be replaced by a (yet to exist) pure Python version of Enthought Traits. Added a new module IPython.lib.inputhook to manage the integration with GUI event loops using PyOS_InputHook . See the docstrings in this module or the main IPython docs for details. For users, GUI event loop integration is now handled through the new %gui magic command. Type %gui? at an IPython prompt for documentation. For developers IPython.lib.inputhook provides a simple interface for managing the event loops in their interactive GUI applications. Examples can be found in our docs/examples/lib directory. The Twisted-based IPython.kernel has been removed, and completely rewritten as IPython.parallel, using ZeroMQ. Profiles are now directories. Instead of a profile being a single config file, profiles are now self-contained directories. By default, profiles get their own IPython history, log files, and everything. To create a new profile, do ipython profile create <name>. All IPython applications have been rewritten to use KeyValueConfigLoader. This means that command-line options have changed. Now, all configurable values are accessible from the command-line with the same syntax as in a configuration file. The command line options -wthread, -qthread and -gthread have been removed. Use --gui=wx, --gui=qt, --gui=gtk instead. The extension loading functions have been renamed to load_ipython_extension() and unload_ipython_extension(). InteractiveShell no longer takes an embedded argument. Instead just use the InteractiveShellEmbed class. __IPYTHON__ is no longer injected into __builtin__. Struct.__init__() no longer takes None as its first argument. It must be a dict or Struct. The functions ipmagic() and ipalias() have been removed from __builtins__. The references to the global InteractiveShell instance (_ip, and __IP) have been removed from the user’s namespace. They are replaced by a new function called get_ipython() that returns the current InteractiveShell instance. This function is injected into the user’s namespace and is now the main way of accessing the running IPython. Old style configuration files ipythonrc and ipy_user_conf.py are no longer supported. Users should migrate there configuration files to the new format described here and here. The old IPython extension API that relied on ipapi() has been completely removed. The new extension API is described here. Support for qt3 has been dropped. Users who need this should use previous versions of IPython. Removed shellglobals as it was obsolete. Removed all the threaded shells in IPython.core.shell. These are no longer needed because of the new capabilities in IPython.lib.inputhook. New top-level sub-packages have been created: IPython.core, IPython.lib, IPython.utils, IPython.deathrow, IPython.quarantine. All existing top-level modules have been moved to appropriate sub-packages. All internal import statements have been updated and tests have been added. The build system (setup.py and friends) have been updated. See this section of the documentation for descriptions of these new sub-packages. IPython.ipapi has been moved to IPython.core.ipapi. IPython.Shell and IPython.iplib have been split and removed as part of the refactor. Extensions has been moved to extensions and all existing extensions have been moved to either IPython.quarantine or IPython.deathrow. IPython.quarantine contains modules that we plan on keeping but that need to be updated. IPython.deathrow contains modules that are either dead or that should be maintained as third party libraries. More details about this can be found here. Previous IPython GUIs in IPython.frontend and IPython.gui are likely broken, and have been removed to IPython.deathrow because of the refactoring in the core. With proper updates, these should still work. We do our best to improve IPython, but there are some known regressions in 0.11 relative to 0.10.2. First of all, there are features that have yet to be ported to the new APIs, and in order to ensure that all of the installed code runs for our users, we have moved them to two separate directories in the source distribution, quarantine and deathrow . Finally, we have some other miscellaneous regressions that we hope to fix as soon as possible. We now describe all of these in more detail. These are tools and extensions that we consider relatively easy to update to the new classes and APIs, but that we simply haven’t had time for. Any user who is interested in one of these is encouraged to help us by porting it and submitting a pull request on our development site. These packages may be harder to update or make most sense as third-party libraries. Some of them are completely obsolete and have been already replaced by better functionality (we simply haven’t had the time to carefully weed them out so they are kept here for now). Others simply require fixes to code that the current core team may not be familiar with. If a tool you were used to is included here, we encourage you to contact the dev list and we can discuss whether it makes sense to keep it in IPython (if it can be maintained). The machinery that adds functionality to the ‘sh’ profile for using IPython as your system shell has not been updated to use the new APIs. As a result, only the aesthetic (prompt) changes are still implemented. We intend to fix this by 0.12. Tracked as issue 547. The installation of scripts on Windows was broken without setuptools, so we now depend on setuptools on Windows. We hope to fix setuptools-less installation, and then remove the setuptools dependency. Issue 539. The directory history _dh is not saved between sessions. Issue 634. As part of the updating of IPython, we have removed a few features for the purpsoes of cleaning up the codebase and interfaces. These removals are permanent, but for any item listed below, equivalent functionality is available. The magics Exit and Quit have been dropped as ways to exit IPython. Instead, the lowercase forms of both work either as a bare name (exit) or a function call (exit()). You can assign these to other names using exec_lines in the config file. This list was generated with the output of git log dev-0.11 HEAD --format='* %aN <%aE>' | sed 's/@/\-at\-/' | sed 's/<>//' | sort -u after some cleanup. If you should be on this list, please add yourself.